2016 Post Election, Red Wine and Chocolate Popsicles ! I know it’s 5 o’clock somewhere ! Here is a fun pick-me-up after a long stressful election year. 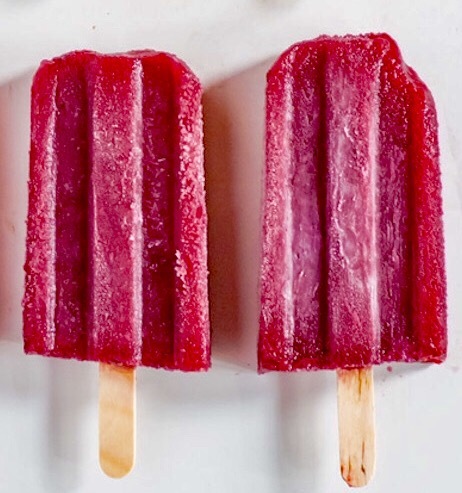 Try my frozen popsicle recipe strictly for adults. Cause, sometimes we need a break too! Not only will these take the edge off the 2016 Election, it will also turn your lips and tongue into a bright shade of red! What the heck! Be a kid again– even if it’s just for a few hours! 1 cup good quality Cabernet wine. In a medium saucepan, heat the sugar and the wine on medium low heat until the sugar dissolves and the mixture just begins to simmer. Add the plums and allow to cook for about 3-5 minutes. Allow to cool slightly. Process everything except the chocolate in a food processor or standing blender until smooth. Return to the saucepan and stir in chocolate to melt and combine. Cool. Pour the mixture into popsicle molds and freeze for about 1½ hours, then insert popsicle sticks. Allow to freeze until solid an additional 3 – 4 hours. To remove from molds, run warm water over the molds to help release the popsicles. Or, freeze in a shallow glass casserole pan stirring a few times during the freeze time. Serve by scooping into bowls! If you are feeling really stressed –just eat it out of the container with a giant spoon! Chef Gigi’s Kabocha Spiced Rum Cake !